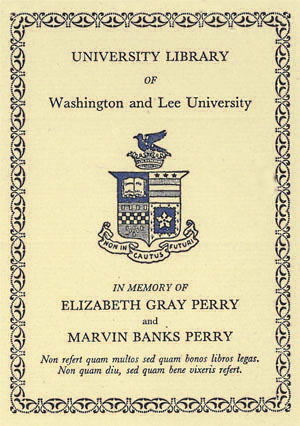 The Elizabeth Gray and Marvin Banks Perry Memorial Fund was established in 1952 by gifts from Marvin B. Perry, Jr. and his father, originally as a memorial to his mother with his father added in 1979. Marvin Perry, Jr. taught English at Washington and Lee for many years before serving as president of Goucher College and then Agnes Scott College. Over the years Perry and his wife, Ellen Gilliam Perry added gifts to build the fund until it was completed via an estate gift following the death of Ellen Perry in 2008. The endowment supports acquisitions for the University Library with a preference for books in English and American Literature. The fund is administered by the University Librarian or her/his designee.